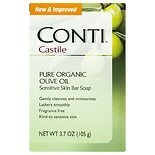 Shop Conti Castile Olive Oil Sensitive Skin Bar Soap Fragrance Free (3.7 oz. )3.7 oz. $389$3 and 89 cents$1.05 / oz.